This level has hard difficulty and you need to use good technique to break the colorbomb with balancing the Odus owl. For this level you should try to play from bottom so candies will shuffle everywhere and give chance to make the colorbomb. After try to break colorbomb with striped candy or other special candy so that it will break colorbomb that are in grills. Then try to break the colorbomb in moonstruck that you will get after 12 and 4 moves remaining to balance the Odus owl and complete the orders. level 430 dreamworld has a clich in it. 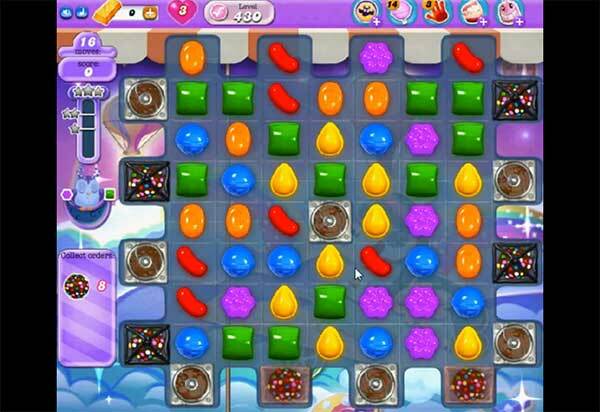 On the level ther are 4 bombs under the black cages not 4 coloured candy like in the tutorials. Can this be fixed? Might be its different on smartphone or its changed. You can give us the screenshot or video then we can post it here. It is imposible to pass this level (Dreamworld 430) with 4 bombs in the cage and 10 coloured candy required in 16 moves. This tutorial doesn’t help! I also have bombs not colour bombs. Can it be fixed? Level 430. Impossible to complete. It seems like there are often glitches on the iPhone version of candy crush. Then they update it and immediately passable. Unfortunately, the latest update did NOT help with this level. Idk why candy crush designers can’t work out this bug. I’ve been on this level for months and the closest I’ve gotten is 2 chocolate bombs away. I’ve also been stuck for months! Your tutorial shows different than the actual game. I don’t even play anymore. It’s not fun when the game has an obvious bug that hasn’t been corrected. Pleas fix this level!! Mine still has bombs NOT sprinkle cookies! I’ve played it a million times and it’s not beatable! FIX IT! I don’t mind a challenge but, this is ridiculous!! DreamWorld level 430 has 4 bombs and 2 sprinkled candies… not what is shown. How can we pass it? Thanks! It’s a shame the bug still isn’t fixed!! I consider quiting playing. I was finally able to beat this level even with the glitch (literally after months of trying and failing). Here’s how: First, I deployed the color bomb booster before even starting the level. While playing, I used the free switch and lollipop hammer boosters as often as possible (these are ESSENTIAL because you can use them without taking away any of your moves). When the level ended, I still needed one more color bomb so I spent the 9 gold (which I got for free from the Green Challenge) and got five extra moves. And that’s how it’s done. Good luck! It still is not fixed, it does not look like the screen above. Still has 4 bombs locked behind X’s and 2 color balls. Supposed to get 8 color balls on the level. Please fix!! It seems there are 2 versions of this level. V ersion 1: With the 4 bombs behind X,s and 2 sprinkled candies. Version 2: In stead of those bombs, 4 sprinkled candies. So in total 6 sprinkled candies. My version is the first one and is impossible to make. I’am playing it for months, using all my extra time I earned in the boxes .